We are back with another contribution to our fabric shopping series from cities around the world. Join me in welcoming both Mary and Holli to the blog. 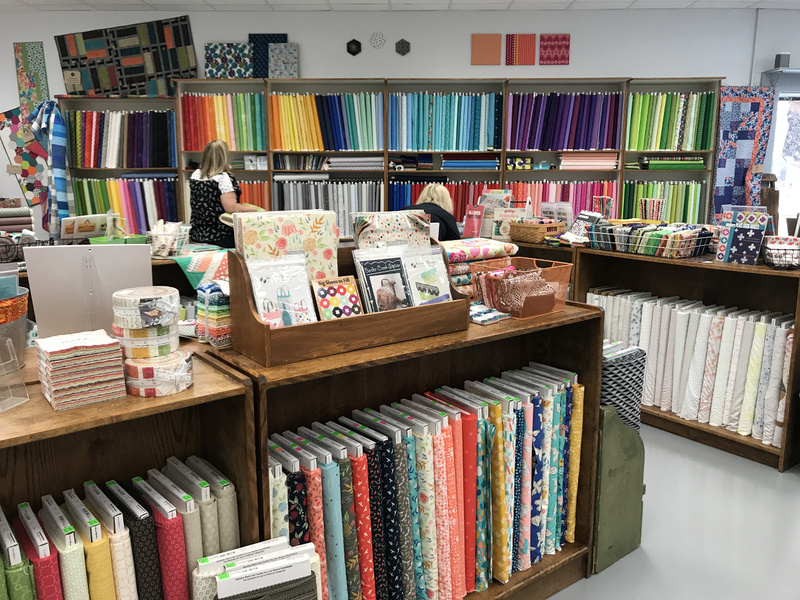 They are giving us a fabric shopping tour of Indianapolis, Indiana. Glad to have you here ladies! 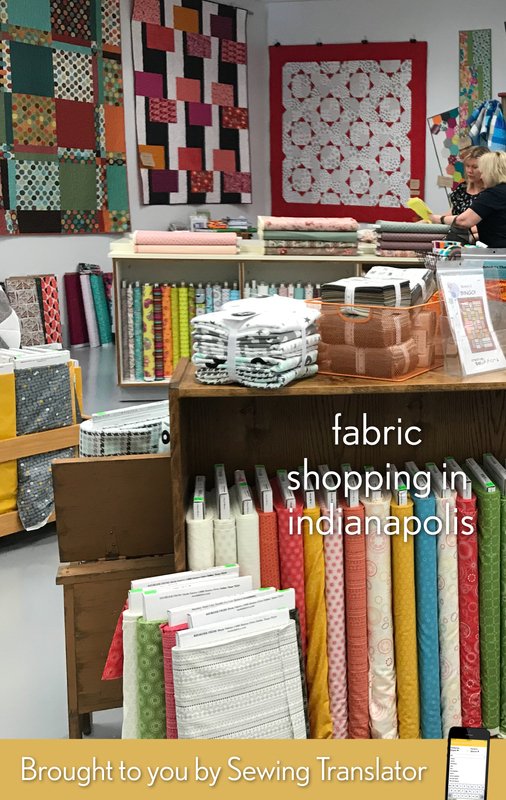 Indianapolis has lots to offer the fabric shopper in our locally owned independent shops around the city and region, all easily accessible by car and parking available immediately adjacent to the shops. 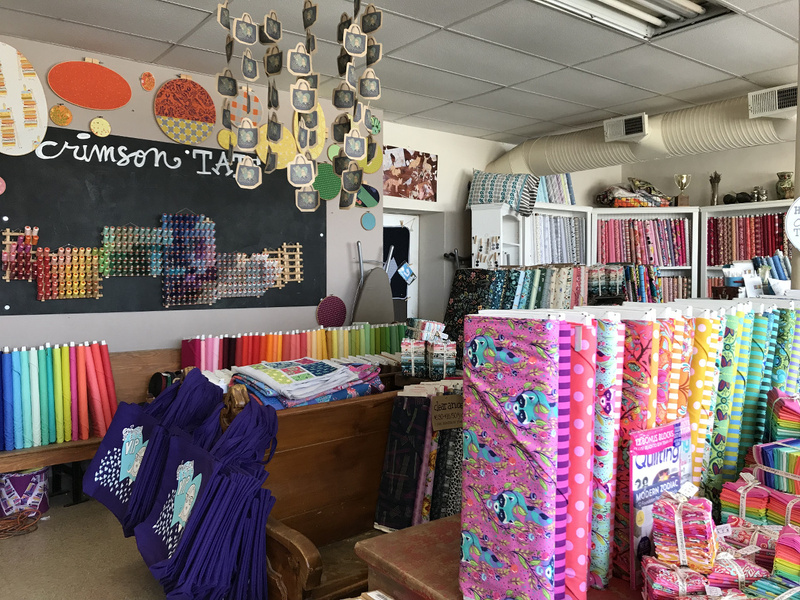 Starting downtown I’ve outlined a fun fabric shop tour. This fun shop is located on the energetic Mass Avenue Cultural District. Heather Givans, the shop owner started her career as a high school art teacher, opening the shop to feed her creative energies. Now in the 7th year, the shop is amazing! 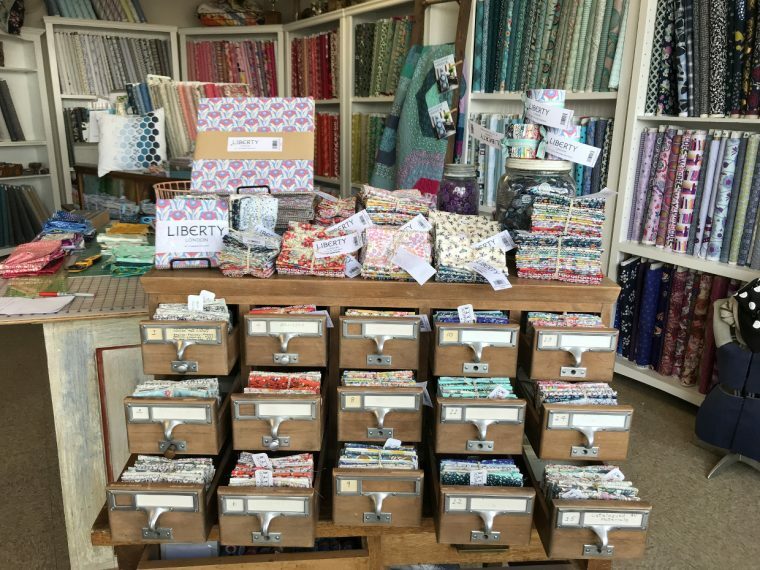 Offering so many unique collections, such as Liberty of London, Tula Pink, Rifle Paper, Cotton + Steele, Art Gallery, unique Japanese and African fabrics it is hard to find a favorite. In addition, Heather is a fabric designer for Windham Fabrics, just releasing her fourth and fifth collections. Plan to spend some time in the shop and feel free to ask the friendly staff for help or ideas. 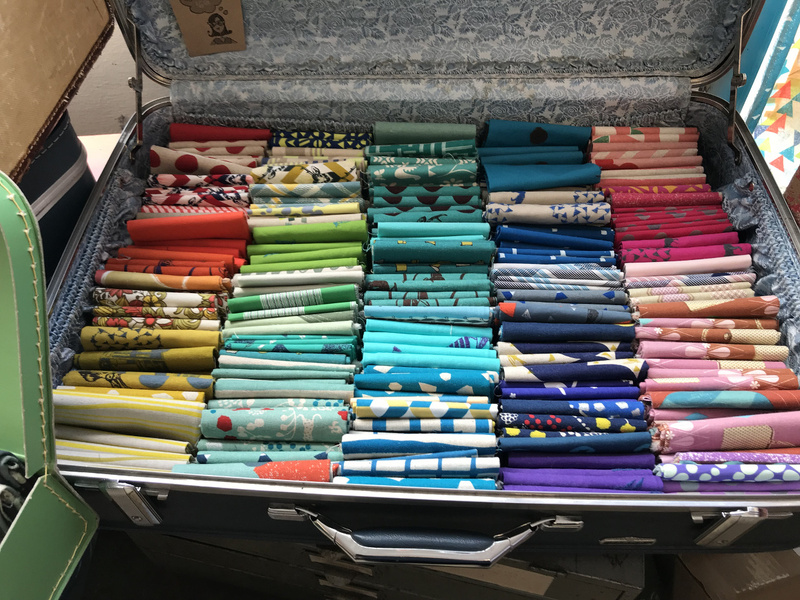 Lots and lots of fabric bundles pre-assembled and project ready for purchase. 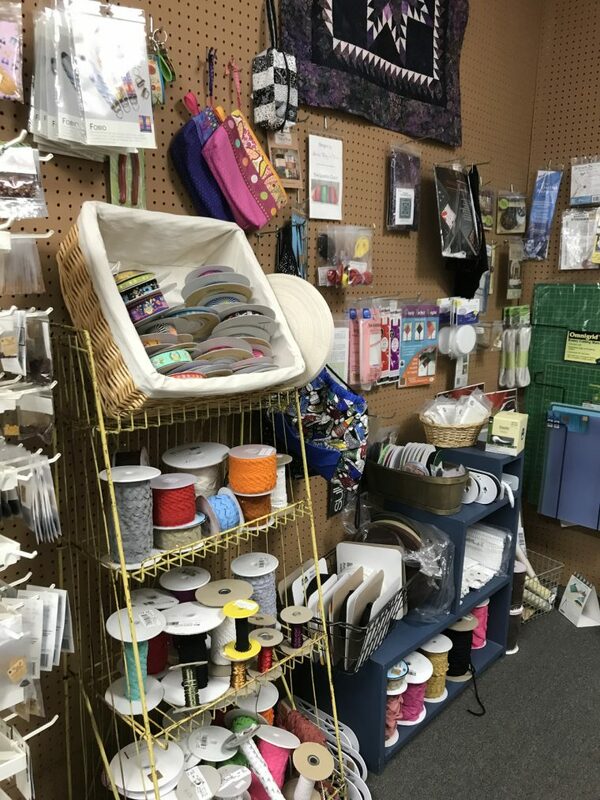 Crimson Tate also offers wide variety of patterns, buttons, notions, trims, zippers, thread and fun things like the Tubby Wobbies hand sewing kits in the photo! EverSewn Machines are for sale, a new brand that is Bernina inspired and affordable. Classes in store, open 7 days a week. Crimson Tate has website for online sales. Check them out on Twitter, Facebook, Pinterest. 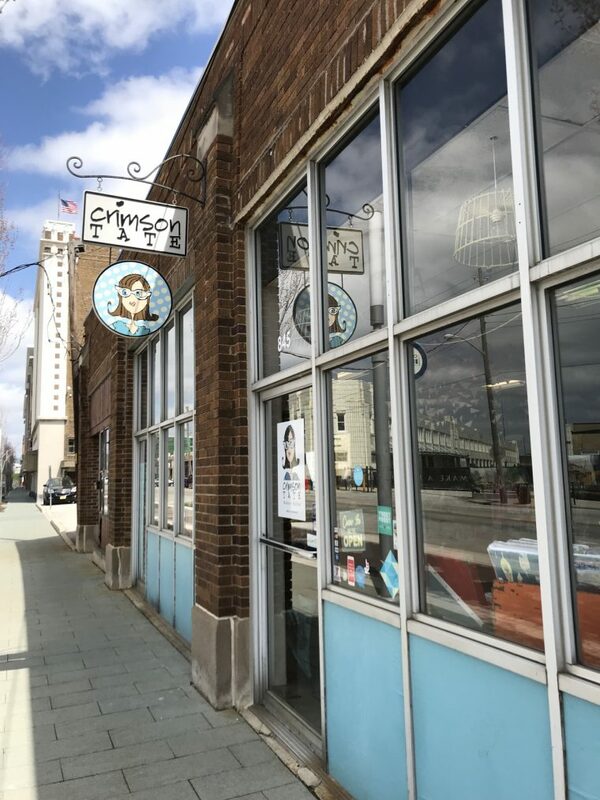 Travel from downtown Indianapolis to the Northeast side, easy access from I-69 at 96th street, for our next stop, French Seam, where vintage and modern meet. This is our premier location to find apparel fabrics and offer many choices including wools, linens, silks, a few special event garment fabrics, knits and some “designer ends.” There is always beautiful cotton collections for garments or crafts available in the shop, too. 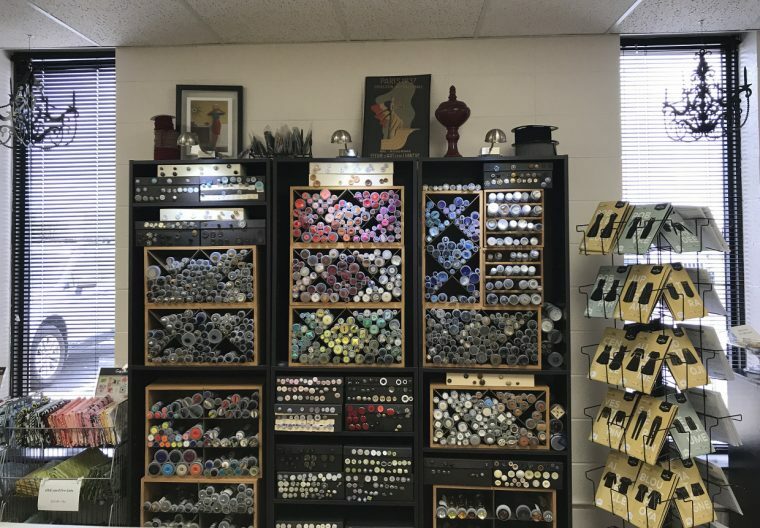 French Seam specializes in carrying unique independent clothing patterns, wide selection of specialty buttons, apparel notions such as zippers, thread, interfacing and lining, and a small but unique trim collection. French Seam has on-line sales options on their website, too. Yuki Sewing machine home line full selection of machines, long arm machines; machine service and cleaning for all makes and models of machines. Classes available for garment sewing, see online schedule for the most up to date offerings. 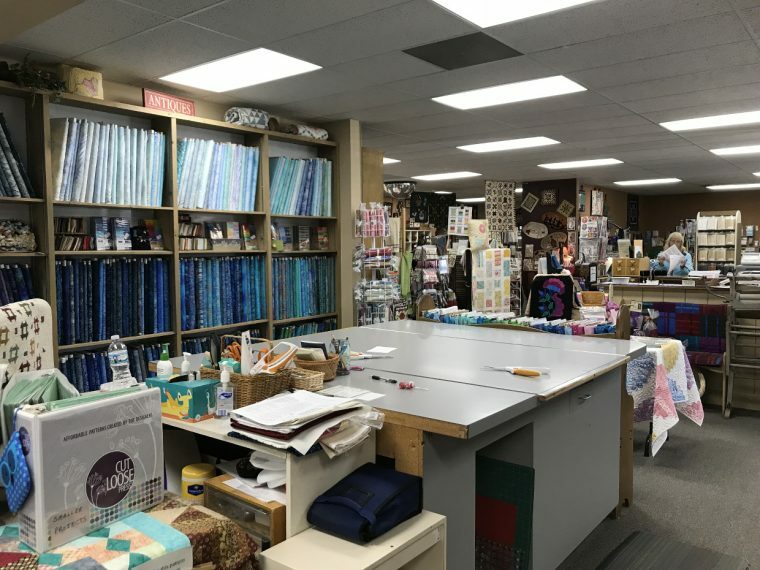 This lovely shop has also been in Indianapolis area for seven years, and is owned Courtney and Linda, a mother and daughter team who love everything related to sewing! Shop has been operating in the Indianapolis area since 1977, now the fourth owner, Connie Lancaster. It is a must see shop with a fresh updated style of contemporary fabrics, mostly cottons, some rayon fabrics, notions and craft patterns. 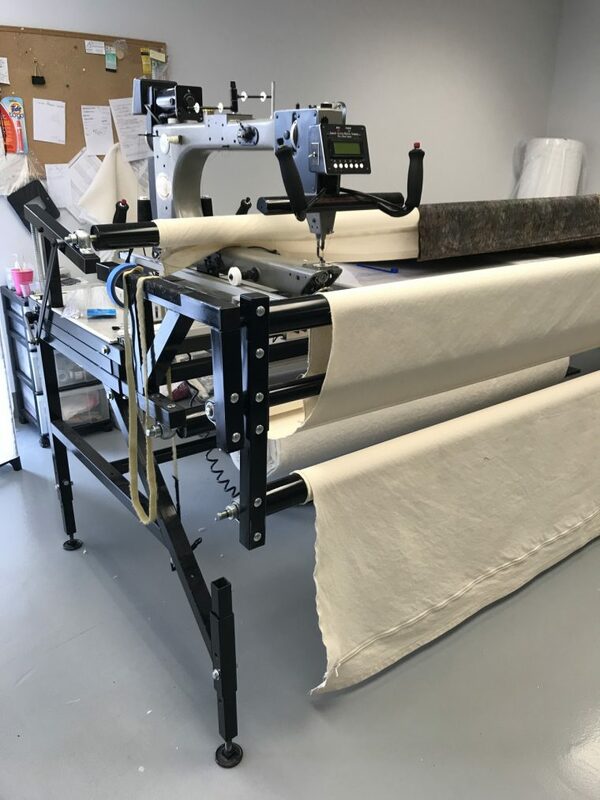 Quilts Plus offers long arm quilting service so customers can have their treasured creations finished in lovely machine quilting. 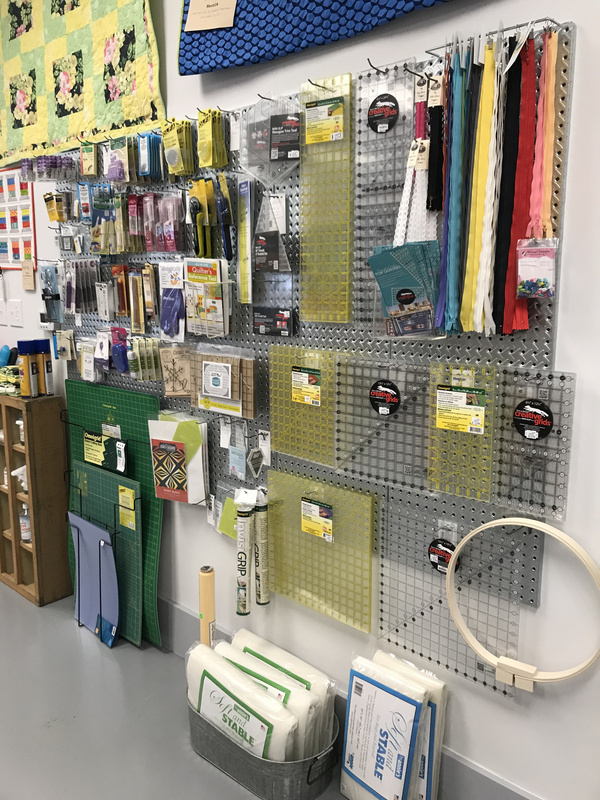 The notions wall offers templates and specialty quilting notions. 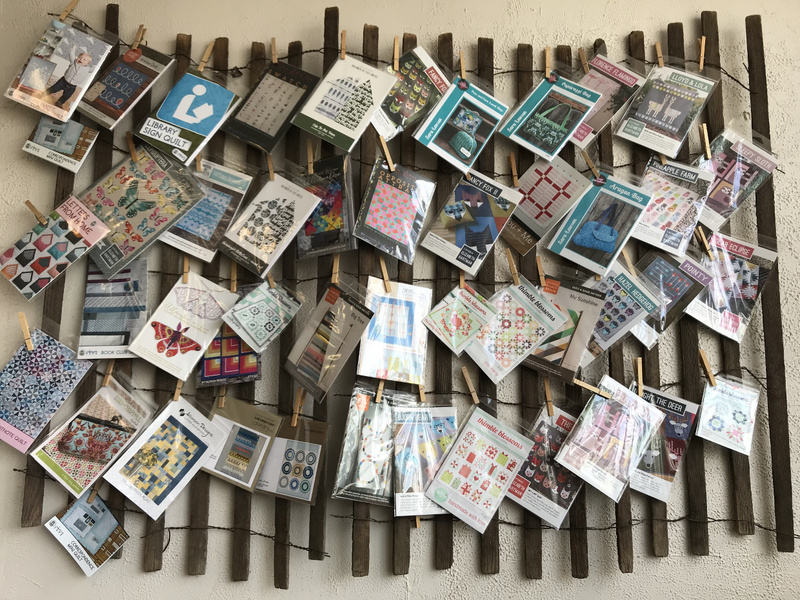 Be sure to check out the Quilt Display Ladders for sale. The beauties display quilts and are sturdy, well-made addition to a home or studio. The store offers classes and clubs, such as the Block of the Month Club and participates in “Row by Row Experience,” a national shop club. There are no on-line sales. Next stop head to Michigan Road just north of 465 to Quilt Quarters, home of Bernina Sewing Machine Sales and expansive cotton fabric selection, with new knits, rayon blend and linen/cotton blend collections for apparel and craft work. 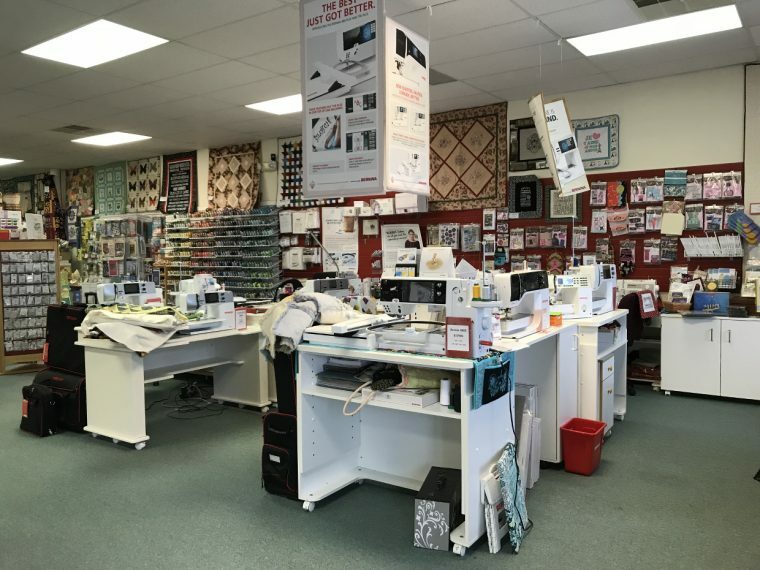 Quilt Quarters is my go to location for Bernina Sewing Machine feet and accessories, hard to find notions or specialty items, and good advice. Lots of patterns and notions too. Shop has been in Indianapolis since 1990. There are no online sales, but have a super helpful staff who are very willing to assist and send purchases to out of town customers. Many class and club opportunities detailed on the website and large teaching classroom in store. Offer machine cleaning and service for Bernina Machines. 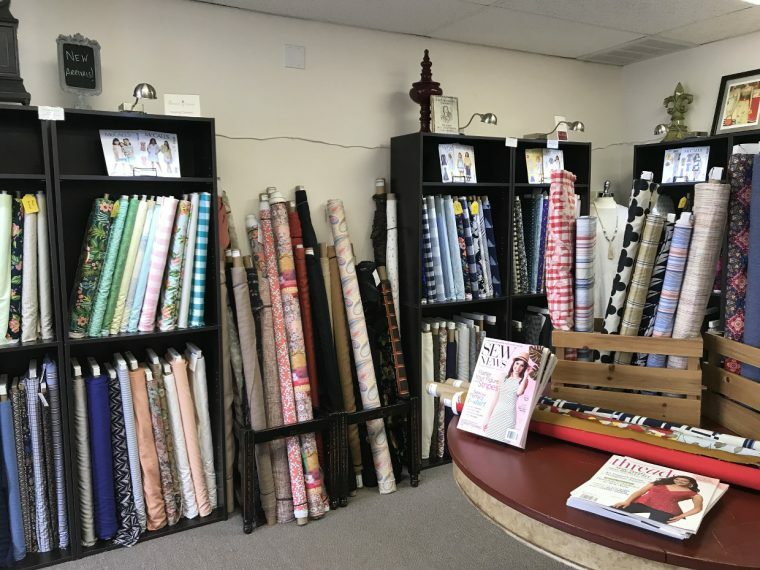 While in the NE corner of the city, you might pop into Calico Corners if you are in need of upholstery fabrics. Fun variety of fabrics to make a purse or a cute skirt as well as decorate your house. Now continue north to the town of Fishers and hit IKEA! While it doesn’t appear to be as large a fabric department as some IKEA stores, it has a nice selection of Scandinavian fabrics. Let’s continue north to Noblesville and go to Always In Stitches. The shop has been in business since 2007 and they have loads of fabrics–some modern, some batiks, great kid’s prints, lots of notions, kits, jars of vintage buttons, a great selection of yarn, a fabric clearance section, classes and sewing machines. If you’ve worked up an appetite, hop next door to Ginger’s Cafe! Now let’s head west and stop in Carmel and visit Griffon Decorative Fabrics. They have been in business for over 20 years and specialize in upholstery fabrics and trims. They have a nice, trendy selection of fabrics to make a cool tote bag, a cute skirt, a handsome pillow or whatever else your house needs. They also offer upholstery services. Now let’s head a little south back into Indy on the north side to the Nora area and go to Back Door Quilts. This large fantastic store with huge class room located just south of I-465, will amaze you. There are example quilts on display everywhere in the store! Back Door seems to have the most extensive collection and variety of quilt patterns in the area, along with lots of supplies, gadgets and accessories. The classroom is huge! And there are several long arm quilting machines. 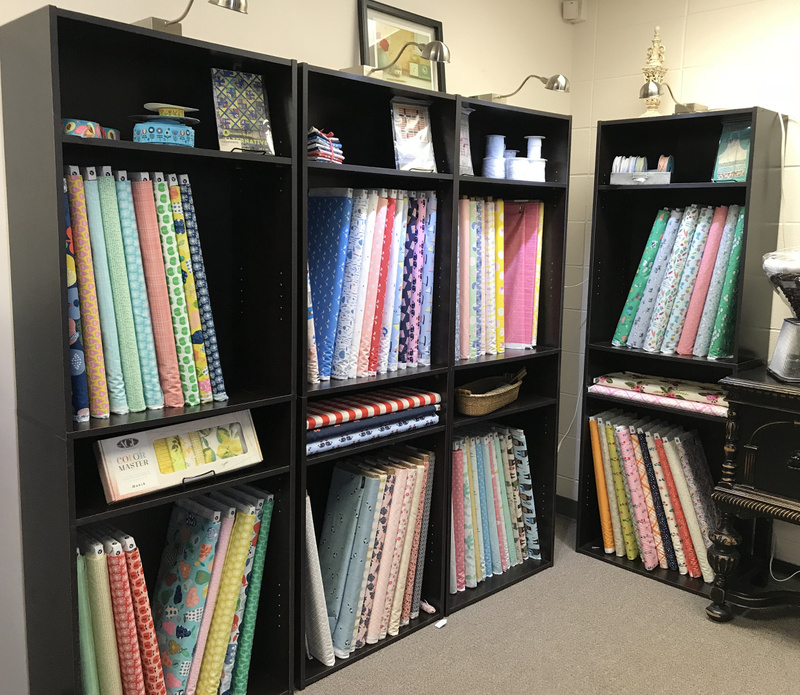 The store offers a class for using the long arm and after completing the class, one can come and reserve time on the machine to quilt you own quilts! 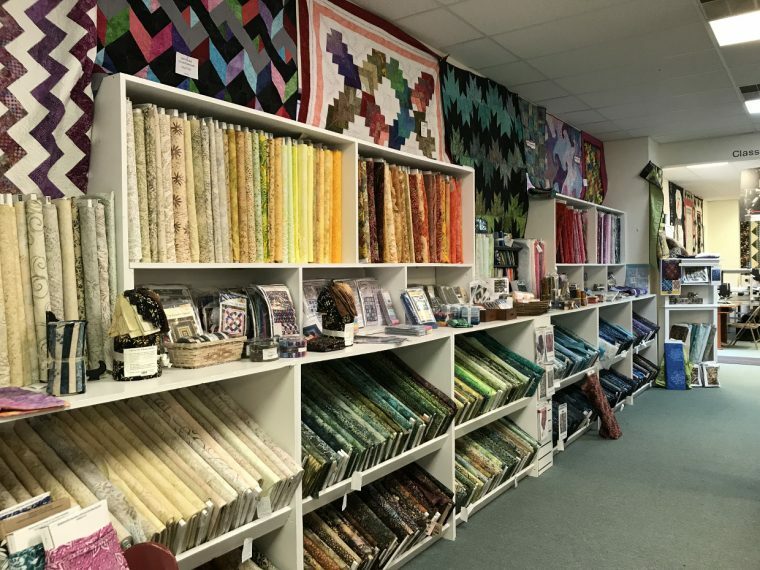 They have been in business for over 44 years and offer a wide selection of traditional cotton fabrics as well as wool felt, kits, notions, patterns and a variety of quilting classes. Check out the website for classes and online kits. If you are in the mood to venture a little farther you can head west of Indy to the tiny town of Danville (about 1/2 hour to the west of the city) and shop for more upholstery fabric. This place is stacked to the ceiling with fabric. Lots of it is 1980’s upholstery, but there are always gems that can be found! There is a whole wall of sheers and open-work curtain-type fabrics that could be really cool skirt overlays, fun beach cover ups or breezy little summer tops. They sell foam for upholstery as well as do upholstery work. They have a great selection of colorful boat vinyl and a selection of trims. Thanks for shopping with us here in Indianapolis, hope you had fun and happy sewing! Oh, my! I cannot believe you were in my town. I really adore Crimson Tate. I do my local shopping there. Nicole, I live here too. We wanted to help share the knowledge of our fantastic local fabric options with others. I’m originally from the Indy area and frequently visit family. Thanks for finding some new options for me to check out. Quilt Expressions in Fishers is one of my favorites, but not mentioned above. Crimson Tate is one of the most energetic shops I’ve ever shopped in! Thanks Olivia. Sorry we missed Quilt Expressions. Will have to check out the store soon! great Olivia – I haven’t been there yet ( quilt expressions ) will have to check it out!! I just moved to Indy from Michigan. This is a timely and lovely post. Thanks!